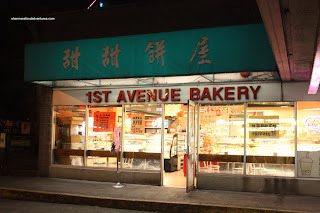 One day, while shopping at the T&T on 1st Ave, Viv and I decided to finally give 1st Avenue Bakery a go. Yah, this place has been here for as long as this complex has existed. However, we never thought of actually trying out their pastries. Hey, from the outside, it really doesn't look all that promising. Look at it. If you want minimalistic, you got it. From the plain teal awning to the basic font of its signage, it ain't trendy. But, faced with the choice between getting T&T bakery items (bleck!) or trying out 1st Ave Bakery, it seemed like a good bet. Inside, the display is a bit messy and the items do look a bit ol' skool. Nothing fancy in here! So we randomly pick a few items which included Cocktail Buns, Pineapple Buns and Lo Poh Beng. What the heck is Lo Poh Beng? Literally translated, it means "wife cake". Well, if it were completely taken literally, it would mean "old wife cake". Yah, makes you want to eat it eh? 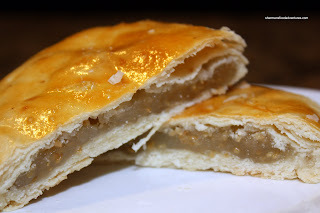 it's basically sweetened winter melon paste within flaky pastry. We only got these because the owner lady recommended it. Honestly, I wasn't holding out much hope for these pastries and buns. However, after picture-taking (like everything I eat), I tried it out. You know what? The Cocktail Bun (essentially a sweet coconut mixture) was very good. 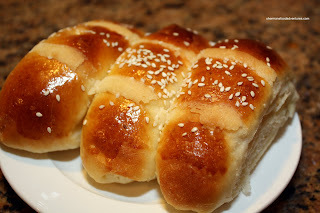 The bun itself was soft and airy; yet not dry while the filling was plentiful and coconuty. The Pineapple Bun, only named because the top looks as such, was again pretty good despite it's pale appearance. 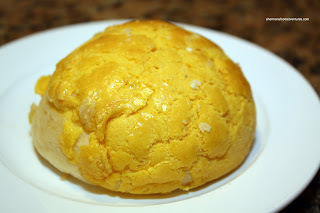 With the same soft and airy bun, it was contrasted by the sugary topping. It was really good after a short nuking. Now for the bad news. Although the Lo Poh Beng was recommended, I really didn't prefer it. I found it dry and bland. While I was chewing it, my mouth was getting dry and I needed to drink some water. It is not even comparable to the ones from Kam Do. Despite this, all of the other buns (we got others too) were solid and very reasonably-priced. Interesting how a random visit to an independent Chinese bakery turns out to be pretty decent. Admittedly I only discovered them not too long ago (2 yrs) accidentally when, while shopping at T&T next door they ran out of coconut/cocktail buns. I needed some for my son (he's addicted to them) so on my way out I poked my head in for a look as the sign didn't hint to me they sell Chinese baked goods. Alas, they're no glamour queen of bakeries, but seems to me everything they make they put their honest heart into it. AND they sell at ridiculously-low prices. Over time I've become a loyal customer to them (at least when I'm in the area). Hope they stick around for another 10-15 years at least. LR, it's just like you... Because it was there in the same complex as T&T. Good stuff really, not pretty, but good.